After Joey died, I went mad. I went crazy with unbearable knowledge. I hid my heart in denial. I blocked out the truth while proceeding to take care of the pitiful details. I took care of my child's "emergency", without admitting to myself that he had actually died. I kept his death temporary in my thoughts, ever mindful to prepare for his return. His death--it still jolts me when I say it or write it, even after three years--the darkest words. I did all the sad things the experts predict, but in the end, nothing changes the facts. Me: textbook bereaved mom, restless inside, scanning, searching, hungering for a resting place. Bit by bit, tiny piece by tiny piece, over the past three years, I have allowed the truth of his goneness to sink in. I can sit with it longer than I used to, but I have to repeat it to myself to latch on to it. It's a progression of ideas inside. My mind travels along a well-rutted path now: It says, " he is gone, he DIED, his body died, his precious body with the beautiful eyes and brilliant hair, the long legs, the fluid walk, the smile, the laugh, GONE. But no, his soul is alive, he is somewhere in the universe, we are separate, but he is alive, he is with God, he is okay, where is he? what's he doing? what's he thinking? Not mine to know. Why? I miss him, I want him back, I can't have him back. Endure. When I die I will see him, what now? go forward, keep moving, my grandchildren need me. Endure. But how? With God's help, one step at a time." howl like a wolf or claw the walls anymore. I can breathe again most of the time. I carry on, and mostly cry when I'm alone. For a long time, I couldn't take on much of anything. I auto-piloted my way through the day, and drowned out the silence of the night. For a long time, I felt betrayed by God. How could You? Why would You? I thought you were my friend. But now I don't blame Him. I understand. It's this world. It's broken and shattered. People break on the sharp pieces of it scattered along their paths. The evidence of that truth is every where, every day. Sharp glass and broken hearts. Life and death and bleeding. And us too. Not spared. Slowly I am moving in closer to God. He has been silent for three years, but a friend says that is the compassion of God, and I believe that now. He shares my grief. With grief, really there aren't any words, anyway. God is quiet but present, as the best friends are. He has been present all along. Trying to rest in that. 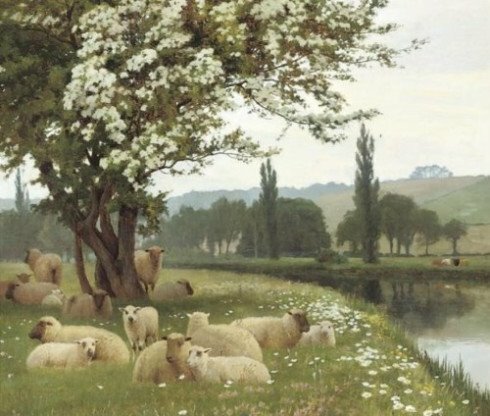 Like a sheep in a meadow by a river. The Lord is my Shepherd, I shall not want. He makes me lie down in green pastures. He leads me beside still waters. He restores my soul. This is beautifully said. I get it. Sending love to you. I thought today, I'm still angry at God but He immediately offers the antidote: Jesus and what He did for me. I'm still working towards the, it's okay part. Thanks Karen, for sharing your heart. I'm glad it's getting a little easier. With all my heart I believe in meeting our loved ones. I feel it so strongly that I believe it is not a thought of this world. I believe eternity touches us many times as we go through this life. And yes, God keeps reminding me He is my friend! Thanks for sharing. Love you my friend. Beautifully written. Resting, it is so hard. I'm not good at it yet, but I have felt it in fleeting moments. Thank you for writing and sharing this, Karen. Of course, "thank you" doesn't convey my heart's gratitude that you were, as always, brave and generous enough to share. Your words are a comfort. Beautiful words... thank you Karen. You paint such an accurate portrait. I had to come by and say hello tonight cause I got to check on my Karen. Hugs to you--biggest hugs ever. Holding your heart in mine! Karen, you do write so movingly. You help to dredge up deep sadness that needs to be brought to the light. Thank you for this. Thanks Karen for sharing this it has helped me so much. I love you guys and appreciate all you have done for me and Maggie. God bless.